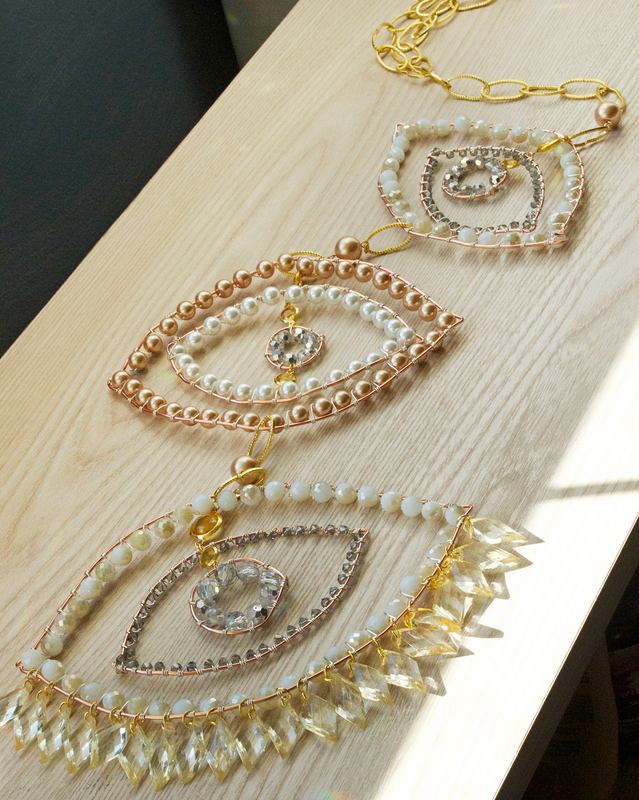 Bring sparkle and shine into your room with this bohemian beaded Third Eye DIY Wall Decor! 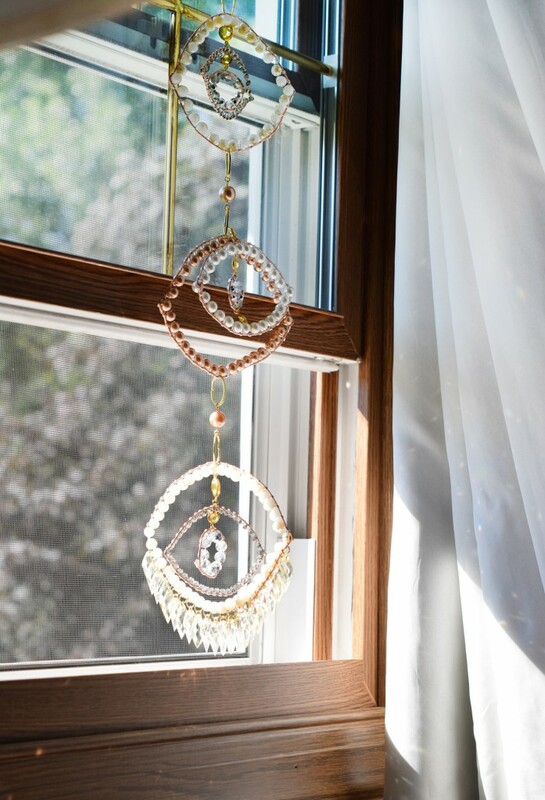 The mix of wire-wrapped pearls, crystals and acrylic beads makes for a multidimensional DIY home decor piece that adds a gypsy-like vibe to your abode. 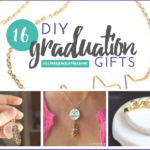 Plus, scroll down for a chance to win a Create and Decorate Prize Pack! This DIY decor project may look complicated to make, but it’s really not, trust me. It will be a bit tedious, but as long as you stay organized, you will be fine! Making frames from sturdy wire and then using thinner wire to wrap with allows you to bend these eye shapes to whatever size you want. I created a fairly big DIY mobile, for maximum impact. Layering these wire frames within each other allows them to spin in the wind. 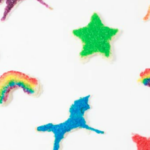 If you use crystals, then your craft project will cast rainbows of light across your walls! 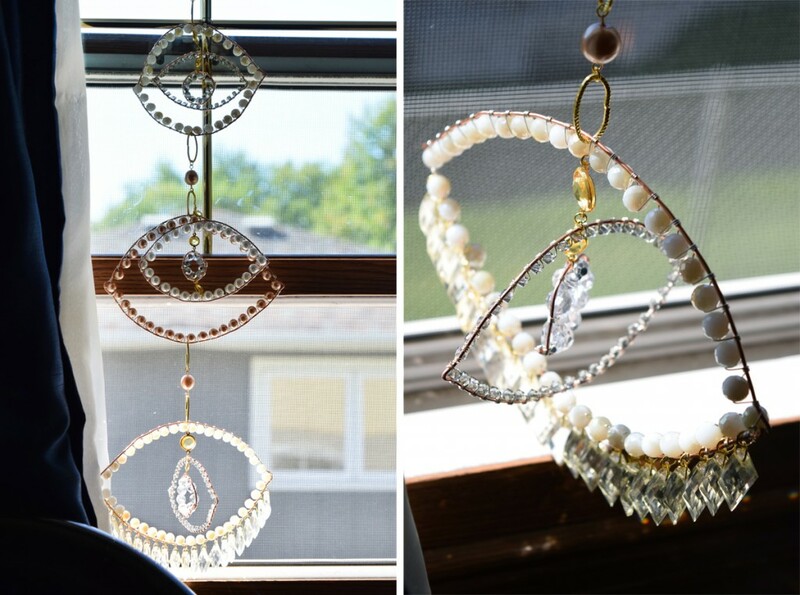 I added acrylic bead dangles on the bottom of the largest eye, for even more movement. Using a yellow topaz color scheme (and yes, I did mix metals here for a boho look) is a little different for me because I love anything black or grey, but I also love the warmth of the palette. Neutrals, yellows, white, and a hint of grey/silver is definitely a winning combination. But, feel free to use any colors you want – make it to match your room’s decor! 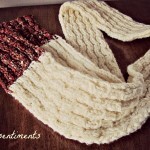 This is another “bead soup” project, meaning that you can use up all your loose ends – feel free to mix bead styles here, anything goes! Enjoy the tutorial! Step 1: Gather materials. For the eye shapes, you need sturdy wire (16 gauge or 14 gauge) – I got this from my local hardware store. Do not try to use soft wire for beading because this will be too flimsy! 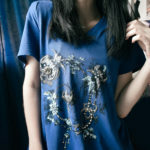 You will then need 24g beading wire for wrapping (soft wire is good here, so feel free to use beading wire). 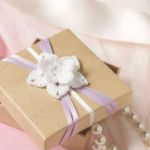 Then, an assortment of beads: pearls, crystals, or even gemstone beads for decorating your frames. I used a mix of Cousin brand 6mm white and tan pearls, 4mm Black Diamond Swarovski bicones, 5mm silver faceted crystals, and 6mm white faceted crystal rounds. Pick any assortment of beads you want, as there are no right or wrong combinations! 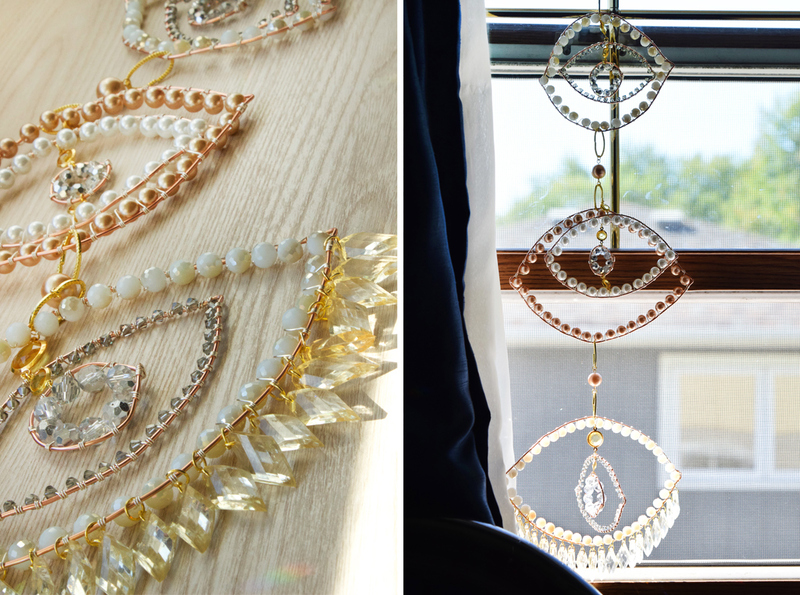 You will also need 6mm and 4mm jump rings (for connecting), acrylic connector links (I used yellow to match, and got these at Michael’s craft stores), gold large link chain (for hanging), acrylic spike beads and eyepins. Be sure to have on hand round nose pliers, wire cutters and flat nose pliers. We will be making a total of 6 EYE SHAPES and 3 CIRCLES. Step 2: For the SMALLEST eye, cut a 14″ piece of sturdy wire. Then, cut a 10″ piece of sturdy wire and fold in half. Lastly, for the CIRCLE, cut an 5″ piece of wire. Step 3: For the MIDDLE eye, cut an 18″ piece of sturdy 16g wire and fold in half. Then, cut a 14″ piece of sturdy wire and fold in half. Lastly, for the CIRCLE, cut an 6″ piece of wire. Step 4: For the LARGEST eye, cut a 22″ piece of sturdy wire. Then, cut an 18″ piece of sturdy wire and fold in half. Lastly, for the CIRCLE, cut an 7″ piece of wire. Step 5: Start wire wrapping your beads to all of your wire shapes. 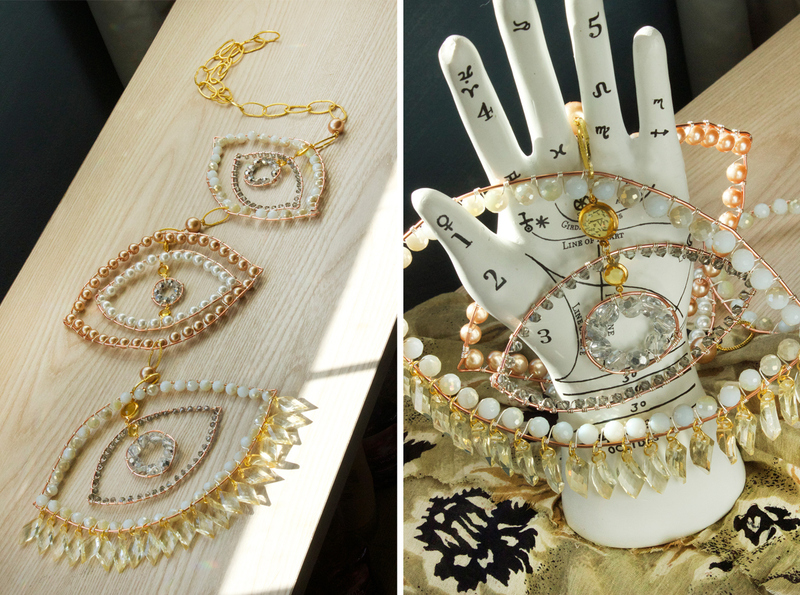 On the MIDDLE eye, I used only 8mm pearls (in white and tan), whereas for the SMALLER and LARGER eyes I used a mix of faceted crystals. As you can see in the above picture on the right, I started wrapping the top of the eye, then used another length of 16g wire to wrap the bottom. I joined the two sides of all frames by wrapping the opposite wire in-between the closing bead, and then cutting all excess wire (including that of the sturdy wire frame). It won’t be perfect, but it will hold just fine! SMALLER EYE: 31 beads (8mm crystals) on outer frame, 34 beads (4mm crystal bicones) on inner frame, 10 beads (5mm crystals) on circle. MEDIUM EYE: 37 total beads (8mm pearls) on outer frame, 27 beads (8mm pearls) on inner frame, 8 (5mm crystals) beads in circle frame. LARGER EYE: 41 total beads (8mm crystals) on outer frame, approx. 48 total beads (4mm crystals) on inner frame, 8 (8mm crystals) beads in circle frame. Step 6: Still with me?! Time to connect all these frames. This part is simple. Take a 6mm jumpring and attach the top loop of a connector charm to the circle frame. Attach another one on the opposite side. Then take more 6mm jump rings and attach these to the top and bottom of your inner eye frame (I’m working on the MIDDLE eye here). Then, simply attach another acrylic link with jump rings to the top of the inner eye frame, and the top of the outer eye frame to connect both frames together. Repeat with your SMALLER eye frames and LARGER eye frames. 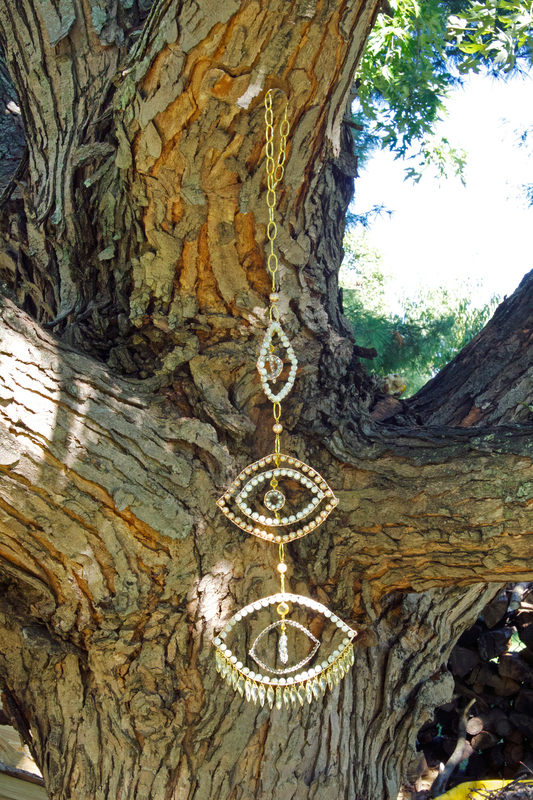 Step 7: To connect all three eyes together, attach 2 links of your large link chain to the top of your outer MIDDLE eye, and with a jumpring again, attach to the bottom of your outer SMALLER eye frame. Then, attach 2 links of your large link chain to the bottom of your outer MIDDLE eye frame to the top of your outer LARGE eye frame. I added pearl links I made from headpins in-between each link of the large link chain, but if you want to keep it simple, leave those out. To add dangles to your LARGER eye, simply attach the acrylic spike beads with jumprings in-between each wire-wrapped bead. You can add your large link chain at the top of the outer SMALLER eye frame to create a hanger (I linked it on itself to create that loop, which is helpful to hang from a window). How’d it go?! I love to hang this on a slightly open window, to get the wind to move the frames. 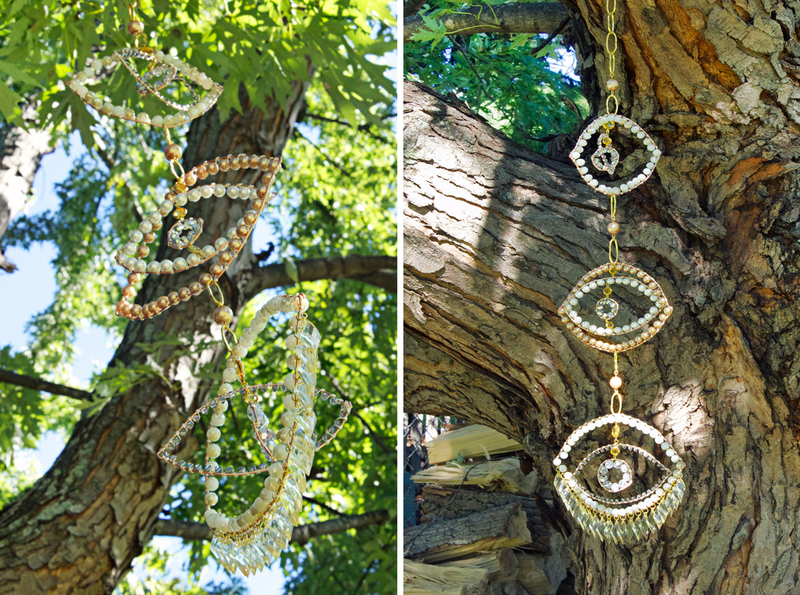 You could also create three separate sun catchers, each with one eye, and hang them in all different spots! 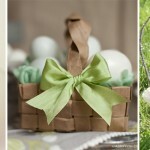 Hang it outside too for a super cool yard party decoration (be sure to pull it back inside, it’s not waterproof!). The possibilities are endless! Check out all my other tutorials on my website, Quiet Lion Creations. 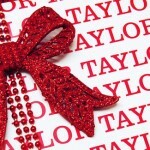 Plus, enter to win this giveaway! 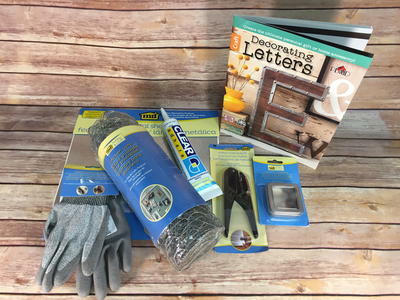 Enter to win for a chance to win a Create and Decorate Prize Pack! What craft projects do you like to create with your stash of leftover beads? I like to use my leftover beads to make Christmas tree ornaments.. I make pretty stars from seasonal fabrics and then stitch colorful beads onto them. I also like to add beads to my quilted table runners. They add such a unique sparkle and look! I like to create beaded bracelets! I’m also yearning to make some Rosary Bracelets with beads from broken Rosaries. Am I entering in the right place? There are only 3 comments. Hope I am! Thanks and God bless!